This retro-inspired card is sure to cause your friend or loved one's face to begin to smile as soon as it is received. The bright cheery oranges and yellows along with the big grinning Orange Smiley positioned front and center are just waiting to wish them a brighter day. All this happiness is topped off with a Happy Birthday printed in a popular script. Each of our free printable birthday cards when selected will prompt and guide you to add a custom printed personal message inside. Feel free to be as creative as you wish and we will showcase your efforts well. 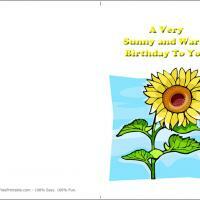 A sunny card of gradient yellows and oranges hosting a large smiley face and capped off with a large Happy Birthday in a cute font is the free printable card you are seeking to brighten someone's day. 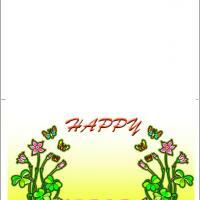 Their face will be set aglow with the card's colors as soon as it is opened. Who could resist that groovy grin? When they open the top flap they will be impressed with the custom printed personal birthday message you have penned just for them. 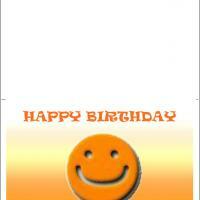 The Smiley Orange birthday card is so easy to print at home and send in the mail today. 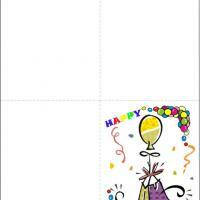 Let these cute free printable cards with smiley oranges send your birthday greetings to friends. Make a happy and groovy message to go with this and your recipient will surely smile as this smiley orange does. For those who are hopelessly retro, those who love sunny colors, and of course, those who love a good smile, this card is just right! These printable birthday cards are fairly simple in their design, but they are very cheerful and of course that is what we always hope for on our birthdays! 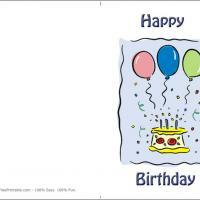 Print one out today and see how quickly your birthday friend or relative's face lights up!